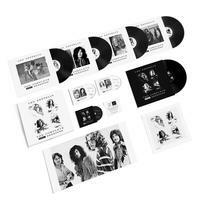 Super Deluxe Edition 5LP and 3CD set featuring recordings made between 1969 and 1971! "Lost" March 1969 session contains the oft-bootlegged, boogieing blues rocker "Sunshine Woman"
A year after Led Zeppelin issued their final catalog reissues, the rock supergroup has uncovered more rarities! Eight unreleased recordings made for the BBC, including a "lost" three-song session from 1969, round out an expanded and remastered edition of the band's 1997 release, BBC Sessions, which covers recordings made between 1969 and 1971, for what it has renamed The Complete BBC Sessions. The previously unreleased tracks include two versions of "Communication Breakdown" and "What Is and What Should Never Be," as well as "Dazed and Confused." The lost, March 1969 session — once fabled to have been erased from its master tapes — contains the oft-bootlegged, boogieing blues rocker "Sunshine Woman," a track that Zeppelin never formally released, and renditions of Willie Dixon's "I Can't Quit You Baby" and "You Shook Me." The session took place the same month that Led Zeppelin, the band's debut album, came out in the U.K.
As with Led Zeppelin's previous reissues, The Complete BBC Sessions will be available in a variety of formats. Those include a 180-gram, five-LP vinyl edition, a digital download and a super deluxe edition. The latter contains all the contents of the other versions, as well as a 44-page book that features photos and details on the recording sessions and a high-quality, limited edition print of the original album cover.